I just finished this book and wow, what a pleasant surprise. This is my first book written by Rae Carson that I have read. I remember hearing about this book all over booktube and thought the concept of a person that could sense gold in the ground was really cool. So I took a chance and pre-ordered it this summer. When it arrived, there was definitely insta- cover love! Very pretty cover and I dived right in. I really liked the main character Leah. She was both strong but still retained her youthful innocence when it came to her love interest.She of course couldn’t read her friend Jefferson so it allowed for a slow burn romance. I also like how it touched even if lightly on the treatment of the Native Americans and Slavery in the story. Their encounters with the Native Americans were not stereotypical from the part of the Natives. However the ignorance of the whites was represented a bit with regards to the Native Americans and I think this was important for her to include that rather than ignore the prejudices that were prevalent during this time period (1849). Her inclusion of a free-black man was also a pleasant surprise and I liked that he played a big part in the story too. 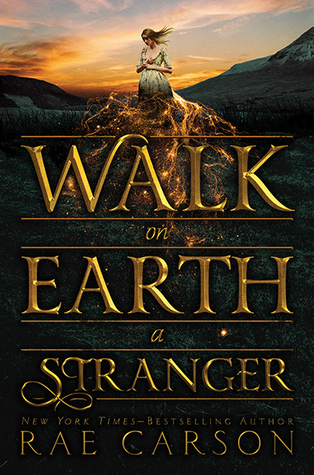 The book initially takes place in Leah’s hometown and then moves on the road towards the west and I truly enjoyed how the book took you on this journey with her. I know little about the American Gold rush and so historical fictions are my fancy for peaking my interest in different aspects in history. I felt like the author did a great job with the details of the atmosphere. I was not disappointed in this book. I think it quickly built a foundation of characters and drew me right in. I felt the pacing was also great. I especially love reading author’s notes at the end of their books. Carson Rae expanded on some of the thought behind her characters and her reasons why to include them. Her decisions reminded me of Sue Monk Kidd’s author notes in that she chose to include a free-black man and they in fact were real people. The rights of women which were pretty much non-existent set up the stage for Leah’s struggle and eventual decision to dress and pretend to be a boy in order to make her journey. I found it both sad and fascinating to witness her journey as a girl pretending to be a boy and all of the rights the boys received. Overall, wow, I really enjoyed this book and look forward to book 2. So I will be giving this book 4.5 butterflies. Previous PostWhat do you do when one of your most anticipated books arrives on your doorstep?